The apple is rich in antioxidants. This writing prompt is reminiscent of the rose scene in American Beauty, except instead of rose petals on a bed, we have…apples in a bath. Not sure who that really does it for, which is kind of the point because that ended up turning into the main part of my story. The main character in the story I made up for this prompt is off camera and this picture is a dream he’s having. Believe it or not, he’s not dreaming of the woman. Although I’m sure she’s a wonderful lady, he barely knows her. She works at the coffee shop where the main character gets his daily spiced apple cider or caramel apple latte or apple pie or apple strudel. You see, this man is cuckoo for apples. Therefore, the apples don’t just happen to be appearing in his dream about this woman, the woman happens to be appearing in his dream about apples. I saw the story starting off with a list of facts about why the apple is so awesome. How many nutrients they have. How they’re low in sugar, may help reduce the chance of cancer, everything. Unfortunately, not many of those facts worked in six words, so I chose to go with the apple being rich in antioxidants, which it is, although I’m not sure it really captured the extent of Mr. Apple’s obsession. We all hated each other. Hated. This prompt is just so obviously staged. Maybe it’s some sort of legitimate inside joke, but more likely it’s a stock photo of some sort. 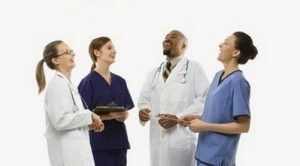 But what if this was an actual photo and these were actual workers in the health care industry? What would it say about their relationships to each other and why they’re so obviously faking this scene? Clearly they all hate each other. I mean, that’s really the only reason people would go to such lengths to pretend they enjoy each other’s company. Right? Right? Well, there may be other reasons, granted, but that’s the working assumption for this story. And why do they hate each other? Because of their work. The work aspect reminded me of Joshua Ferris’s novel, Then We Came to the End, a book about working in an advertising agency. Ferris uses a first-person plural point of view for much of the novel, which is written a bit in the style of Tim O’Brien’s The Things We Carried. Only instead of slogging through Vietnam, the characters are figuring out how to survive in the marketing world when all the co-workers are a little bit crazy. Anyways, I felt that style would might work with this story also. The concept is a toxic workplace in a hospital. These characters are all trying to do their jobs for varying reasons, but they’re underfunded, overworked, and their motivations grate on each other’s nerves. Basically, they’re trying to survive and the story is about how they do just that and learn about themselves in the process. Who knew phones were so addictive? Quite a few writing exercises ask the writer to get beyond first impressions. It’s basically just brainstorming, but I think one of the ideas behind the practice is that truly interesting and different twists on stories go beyond easy interpretations. In this case, I thought the easy story was that the couple in this picture were having problems with their phone. Pretty reasonable, I mean the image of older adults being technology illiterate is practically a trope. But what if the couple isn’t having trouble with the phone at all? What if they’re practically masters at using the technology, and the looks of consternation are in reality because of whatever is on the phone itself? Maybe they’re just super into Candy Crush. Or maybe they’re texting their son, who’s late to the supper that’s in the background. That started to get interesting, so I came up with the following story. 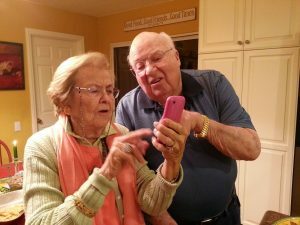 This couple were technology skeptics, but that changed when they got their first smart phone. Now they’re on virtually every social media platform that exists. Unfortunately, they’re a little too willing to believe everything they see on the internet. They buy into all the memes and have never heard of photoshop and before they know it, they’re up to their armpits in conspiracy theories. So the story is all about separating fact from fiction in the lives of this pair as they struggle to first understand they have an addiction, and then deal with it. That’s it for this week, my thanks to Twitter user @AgathaChocolats for the writing prompts!